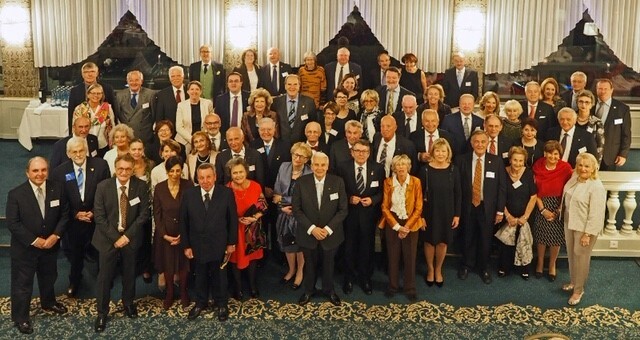 The participants during this weekend were Italian, Maltese, Swiss and Liestentein Rotarians. Although the official language spoken at these yearly fellowship meetings is Italian, there were several participants who spoke English well and therefore we were always comfortable communicating with most participants. The yearly event held in September is hosted by a club from a rotating participating country. Each host club goes to great lengths to have participants visit the best of their region and this year we had a well executed programme prepared for us. On arrival on Thursday we gathered to welcome drinks at the hotel’s waterfront garden and renewed our acquaintances, and right after this was followed by dinner. Swiss nation.There were unique items to view of particular interest. We then went on to visit the Einsiedeln Benedictine Abbey. It contains the Einsiedeln Abbey Library displaying a collection of priceless manuscripts and prints and over 230000 books with an annual intake of up to 800 volumes (worth a browse on Google). Saturday started with a high standard address by eminent speakers who addressed the dangers of climate warming, its consequential changes, and what can be done to reduce these dangers. This was followed with a delightful boat ride while we had lunch on board this luxury paddle boat all the way to Luzern. Our guide took us around the city where we were shown the historical and architectural highlights of the city. Rather tired after the walk around we were pleased to return to Brunnen on a large coach that took us back to the hotel. Saturday evening was the farewell gala dinner, our only elegant evening. Sunday morning ended with mass for those that wished to attend. Next year’s meeting will be held in Malta between the 26th and 29th September 2019 and it would be encouraging for the organising committee if more Rotarians from Malta and Gozo would participate.